I am lazy and don’t have time to make anything fancy so I make this appetizer and eat it as my meal. 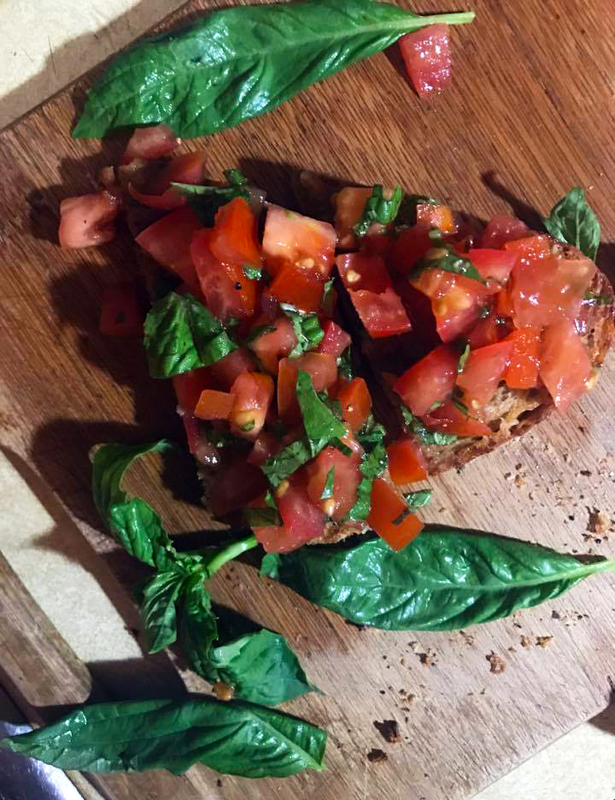 Regardless of all that, let’s quickly talk about bruschetta. That being said, the most important aspect of any bruschetta is the ingredients. Make sure you get great ingredients – because you’re not doing much to them so you will get the best result out of the freshest, in-season ingredients. First, grill the bread. Pre-heat a large grill pan (or a heavy-bottom pan if you don’t have a grill pan, cast iron also works beautifully) and add 2 tablespoons of olive oil to it – spread it evenly. Take the two bread slices and put them in, pressing them flat against the surface. Turn the heat down to low and grill until golden brown and crispy, turn, and repeat on the other side. This will take a few minutes, so be patient. Next, in a bowl, combine the diced tomatoes and basil, season with salt and pepper, and add in the remaining 2 tablespoons of extra virgin olive oil and the balsamic vinegar. Toss well to coat the tomatoes – don’t overmix too much so the tomatoes don’t get too mushy/watery. Once the bread is grilled on both sides, take the clove of garlic and rub it on one side of each slice – you will notice that the crispy surface of the bread will act like a grater and will grate down the garlic. Doing it this way as opposed to adding the garlic straight into the tomatoes allows very even distribution of garlic and enhances the flavor of the bread. Another alternative, if you don’t like the taste of raw garlic, is to toast it in the pan along with the bread on very low heat and then rub it on the bread. Toasting the garlic will take that raw edge off, but still leave you with the wonderful aroma and a smokier taste. Top the bread, garlic side up, with an even layer of the tomatoes, cut into pieces (if using small slices, no need to cut) and serve!